March 24, 1931: The first of a two-evening engagement for “The Gumm Sisters” (Judy and her sisters) at the Farmer’s Institute Meeting held at the Lancaster Grammar Schook, Lancaster, California. March 24, 1937: This short article notes that Judy, “youthful film actress” will continue to guest star on the “Jack Oakie’s College” radio show every Tuesday night, from 9:30 to 10:30 (Eastern Time). March 24, 1938: The final night of Judy’s Everybody Sing tour was on this night at the Michigan Theater in Detroit. Judy and her mom returned to Chicago the next day, then went to Minneapolis and finally her birthplace, Grand Rapids (both in Minnesota). 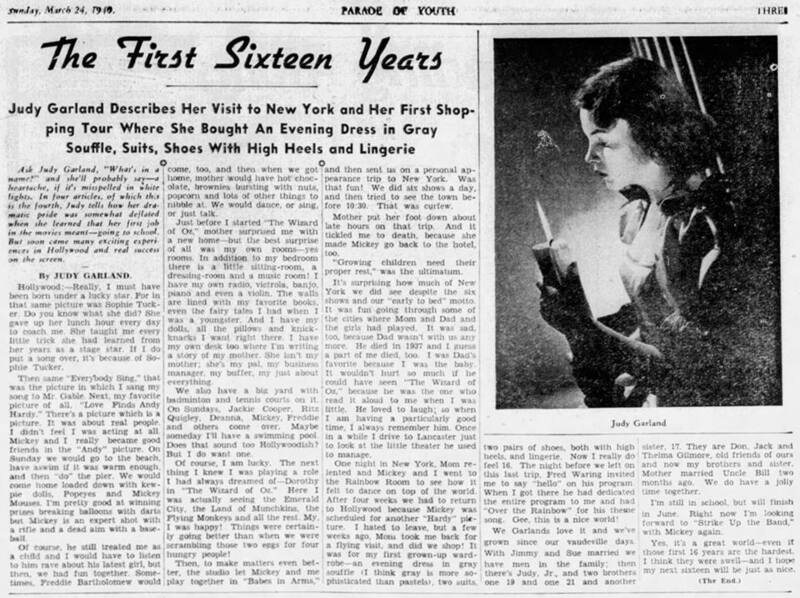 March 24, 1940: “The First Sixteen Years” – The fourth and final article in a series of articles allegedly written by Judy describing her first sixteen years. 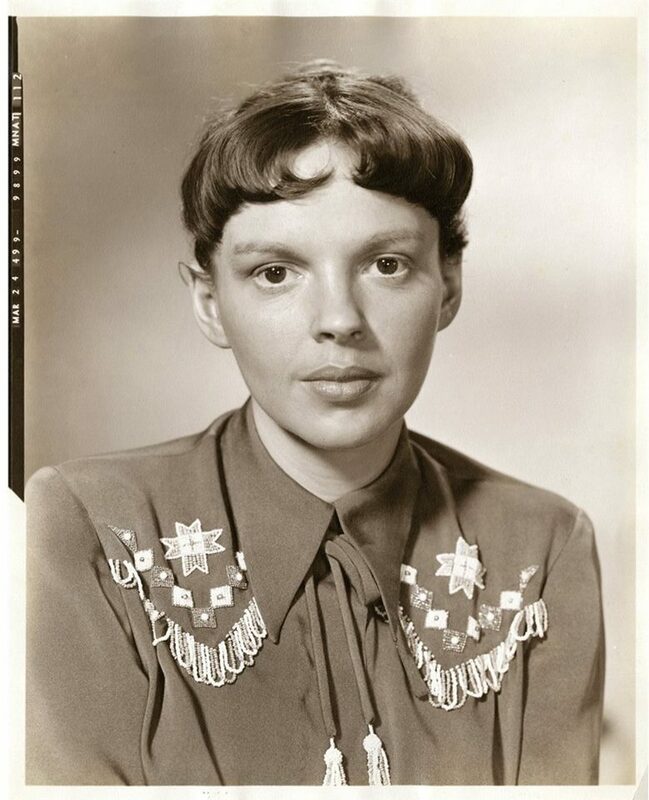 Ask Judy Garland, “What’s in a name?” And she’ll probably say – a heartache, if it’s misspelled in white lights. 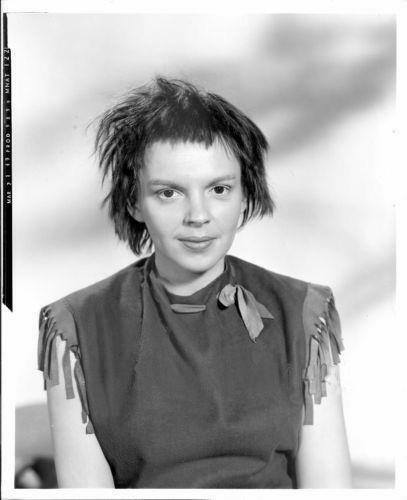 In four articles, of which this is the fourth, Judy tells how her dramatic pride was somewhat deflated when she learned that her first job in the movies meant – going to school. But soon came many exciting experiences in Hollywood and real success on the screen. Hollywood: – Really, I must have been born under a lucky star. For in that same picture was Sophie Tucker. Do you know what she did? She gave up her lunch hour every day to coach me. She taught me every little trick she had learned from her years as a stage star. If I do put a song over, it’s because of Sophie Tucker. Then came “Everybody Sing,” that was the picture in which I sang my song to Mr. Gable. Next, my favorite picture of all, “Love Finds Andy Hardy.” There’s a picture which is a picture. It was about real people. I didn’t feel I was acting at all. Mickey and I really became good friends in the “Andy” picture. On Sunday we would go to the beach, have a swim if it was warm enough, and then “do” the pier. We would come home loaded down with kewpie dolls, Popeyes and Mickey Mouses. I’m pretty good at winning prizes breaking balloons with darts but Mickey is an expert shot with a rifle and dead aim with a baseball. Of course, he still treated me as a child and I would have to listen to him rave about his latest girl, but then, we had fun together. Sometimes, Freddie Bartholomew would come, too, and then when we got home, mother would have hot chocolate, brownies bursting with nuts, popcorn and lots of other things to nibble at. We would dance, or sing, or just talk. Just before I started “The Wizard of Oz,” mother surprised me with a new home – but the best surprise of all was my own rooms – yes rooms. In addition to my bedroom, there was a little sitting-room, a dressing-room and a music room! I have my own radio, victrola, banjo, piano and even a violin. The walls are lined with my favorite books, even the fairy tales I had when I was a youngster. And I have my dolls, all the pillows an knick-knacks I want right there. I have my own desk to where I’m writing a story of my mother. She isn’t my mother; she’s my pal, my business manager, my buffer, my just about everything. We also have a big yard with badminton and tennis courts on it. On Sundays, Jackie Cooper, Ritz Quigley, Deanna [Durbin], Mickey, Freddie and others come over. Maybe someday I’ll have a swimming pool. Does that sound too Hollywoodish? But I do want one. Of course, I am lucky. The next thing I knew I was playing a role I had always dreamed of – Dorothy in “The Wizard of Oz.” Here I was actually seeing the Emerald city, the Land of Munchkins, the Flying Monkeys and all the rest. My, I was happy! Things were certainly going better than when we were scrambling those two eggs for four hungry people! Then, to make matters even better, the studio let Mickey and me play together in “Babes in Arms,” and then sent us on a personal appearance trip to New York. Was that fun! We did six shows a day, and then tried to see the town before 10:30. That was curfew. Mother put her foot down about late hours on that trip. And it tickled me to death, because she made Mickey go back to the hotel, too. “Growing children need their proper rest,” was the ultimatum. It’s surprising how much of New York we did see despite the six shows and our “early to bed” motto. It was fun going through some of the cities where Mom and Dad and the girls had played. It was sad, too, because Dad wasn’t with us anymore. He died in 1937 and I guess a part of me died, too. I was Dad’s favorite because I was the baby. It wouldn’t hurt so much if he could have seen “The Wizard of Oz,” because he was the one who read it aloud to me when I was little. He loved to laugh; so when I am having a particularly good time, I always remember him. Once in a while I drive to Lancaster just to look at the little theater he used to manage. One nice in New York, Mom relented and Mickey and I went to the Rainbow Room to see how it felt to dance on top of the world. After four weeks we had to return to Hollywood because Mickey was scheduled for another “Hardy” picture. I hated to leave, but a few weeks ago, Mom took me back for a flying visit, and did we shop! It was for my first grown-up wardrobe – an evening dress in gray soufflé (I think gray is more sophisticated than pastels), two suits, two pairs of shoes, both with high heels, and lingerie. Now I really do feel 16. The night before we left on this last trip. Fred Waring invited me to say “hello” on his program. When I got there he had dedicated the entire program to me and had “Over the Rainbow” for his theme song. Gee, this is a nice world! We Garlands love it and we’ve grown since our vaudeville days. With Jimmy and Sue married we have two men in the family; then there’s Judy, Jr., and two brothers one 19 and one 21 and another sister, 17. They are Don, Jack, and Thelma Gilmore, old friends of ours and now my brothers and sister. Mother married Uncle Bill two months ago. We do have a jolly time together. I’m still in school, but will finish in June. Right now I’m looking forward to “Strike Up the Band,” with Mickey again. Yes, it’s a great world – even if those first 16 years are the hardest I think they were swell – and I hope my next sixteen will be just as nice. March 24, 1942: Recording session for For Me And My Gal, which was still titled The Big Time. 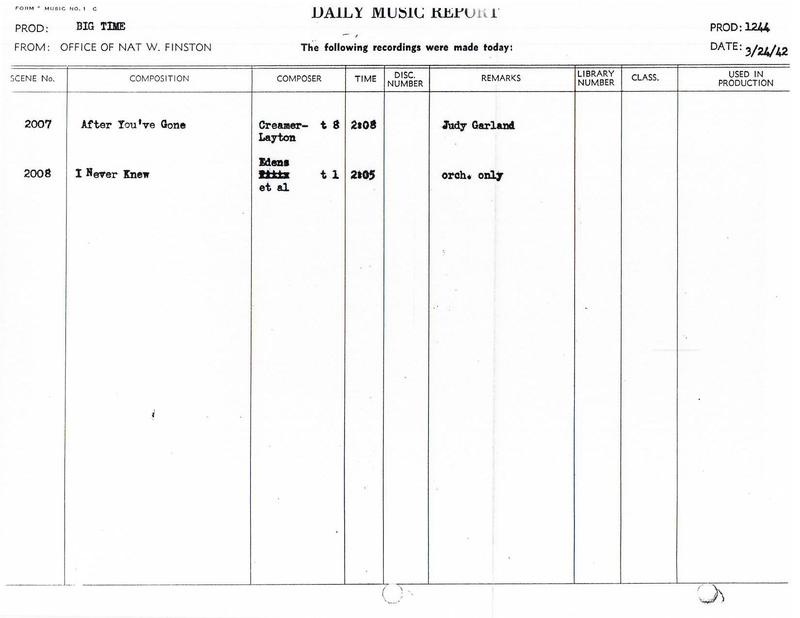 Judy pre-recorded “After You’ve Gone.” Only one take, #8, was printed. Also recorded was an instrumental called “I Never Knew” which is not known to have survived. March 24, 1943: Filming continued on Girl Crazy on the “Interior Dean’s Office” and “Interior Governor’s Office” sets. Time called: 10:00 a.m.; dismissed: 5:35 p.m.
March 24, 1944: Filming continued on Meet Me In St. Louis on the “Exterior Smith House and Street” set, which was the new permanent standing set on MGM’s Backlot #3, the “St. 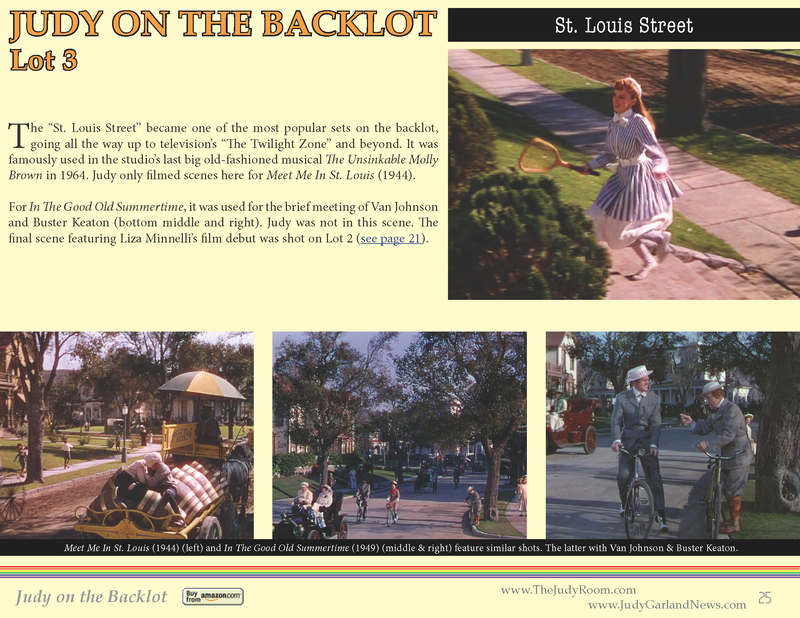 Louis Street” which was built specifically for the film and ended up being one of the most used sets on the backlot, popping up in many films and TV shows. 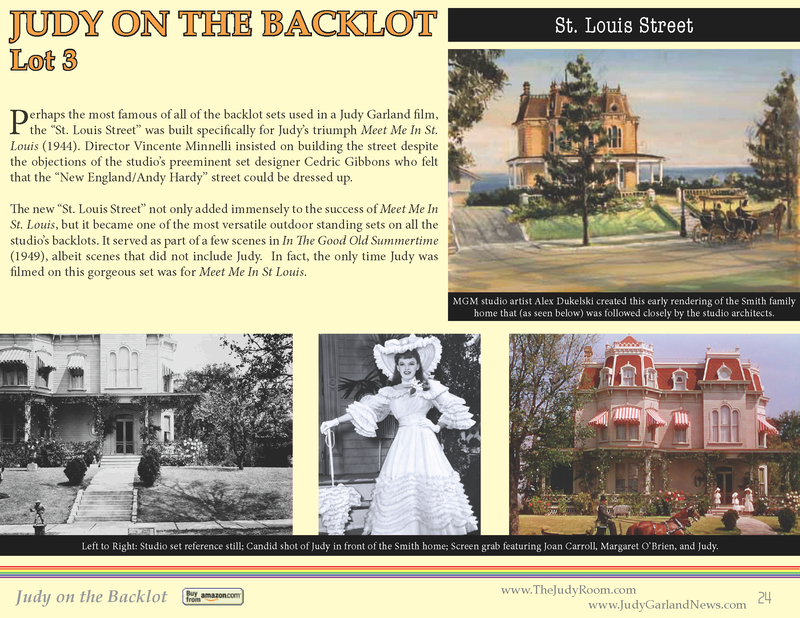 Time called: 10:00 a.m.; Judy was ready at 11:00 a.m.; dismissed: 4:30 p.m.
For more about MGM’s backlots and where Judy’s movies were filmed, check out the “Garlands For Judy” special “Judy on the Backlot” edition here (PDF). 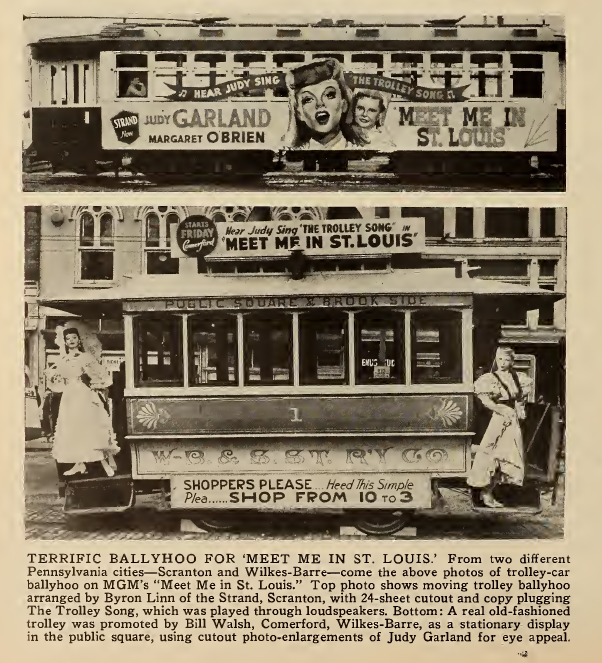 March 24, 1945: Here is an article and photos about the recent promotion for Meet Me In St. Louis in Minneapolis, Minnesota (the article on the left) and Scranton and Wilkes-Barre, Pennsylvania (the photos on the right), as published in the “Shomens’s Trade Review” movie trade paper. Wouldn’t it be great to get on one of those streetcars (they weren’t actual trolleys) on the way to work? Wouldn’t it also be great if one or both of those standees from the lower photo actually survived? 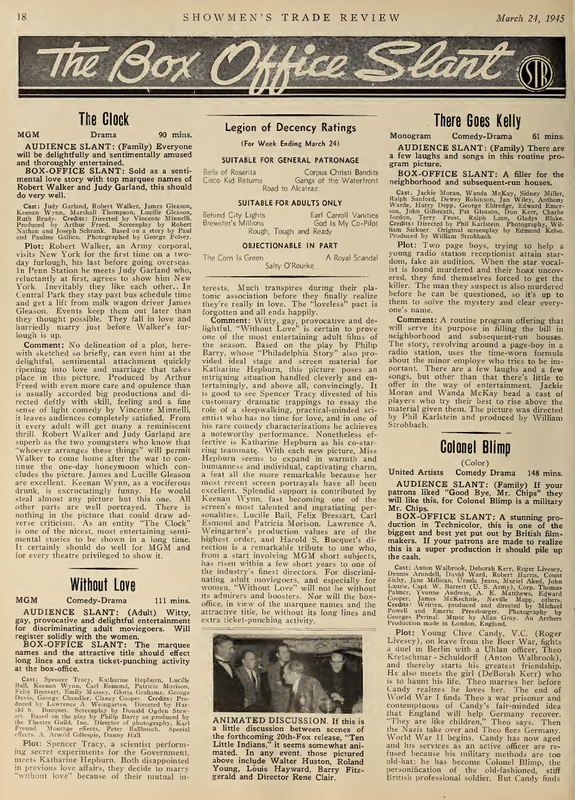 March 24, 1945: Also from the “Showmen’s Trade Review” is this review of The Clock. No delineation of a plot, herewith sketched so briefly, can even hint at the delightful, sentimental attachment quickly ripening into love and marriage that takes place in this picture. Produced by Arthur Freed with even more care and opulence than is usually accorded big productions and directed deftly with skill, feeling and a fine sense of light comedy by Vincente Minnelli, it leaves audiences completely satisfied. From it, every adult will get many a reminiscent thrill. Robert Walker and Judy Garland are superb as the two youngsters who know that “whoever arranges these things” will permit Walker to come home after the war to continue the one-day honeymoon which concludes the picture. James Lucille Gleason are excellent. Keenan Wynn, as a vociferous drunk, is excruciatingly funny. He would steal almost any picture but this one. All other parts are well portrayed. There is nothing in this picture that could draw adverse criticism. As an entity “The Clock” is one of the nicest, most entertaining sentimental stories to be shown in a long time. It certainly should do well for MGM and for every theatre privileged to show it. Check out The Judy Roon’s Filmography Pages on The Clock here. 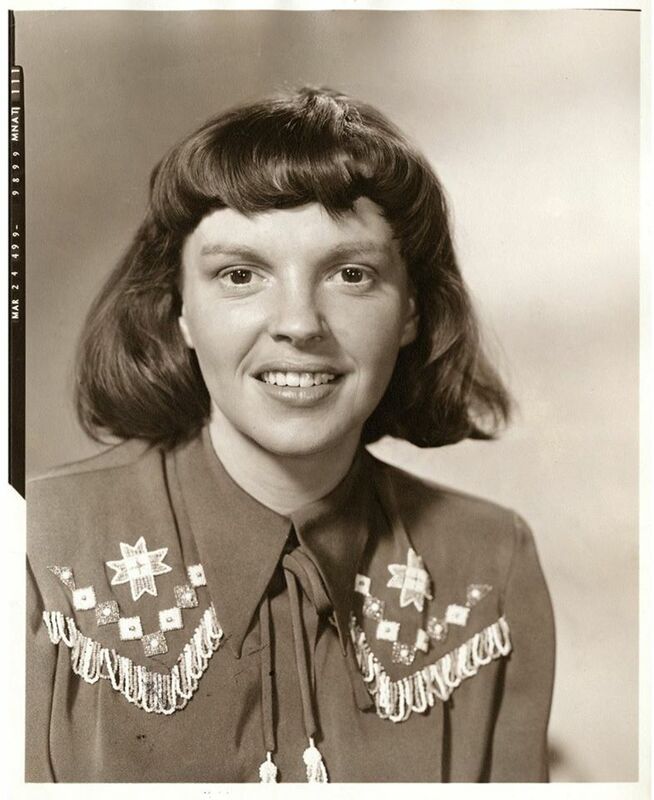 March 24, 1949: More wardrobe and makeup tests for “Annie Get Your Gun” including the tests shown above. Judy was due on the set at 8:30 a.m. Per the assistant director’s notes: “Miss Garland was in at 8:30 a.m. to have hair dyed; Lunch 11:30 a.m. to 12:30 p.m.; due on set: 1:15. Arrived at 1:15; due to illness of Frank Morgan, rehearsal was cancelled and Mr. [Howard] Keel made comparative makeup test with Miss Garland from 2 p.m. to 2:30 p.m.” Dismissed at 3:50 p.m.
March 24, 1953: A radiant Judy attended a reception at Arthur Freed’s home. 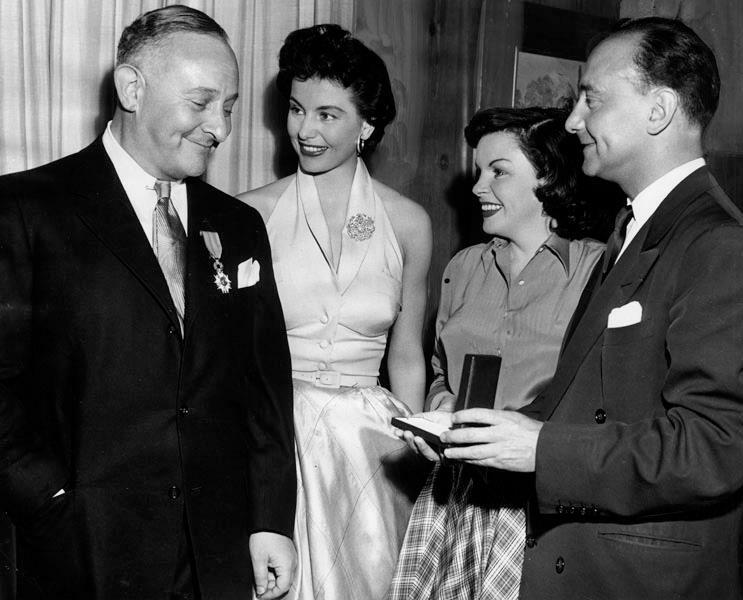 Freed had just been presented with France’s Legion of Honor Award presented to him by the French Consul General. 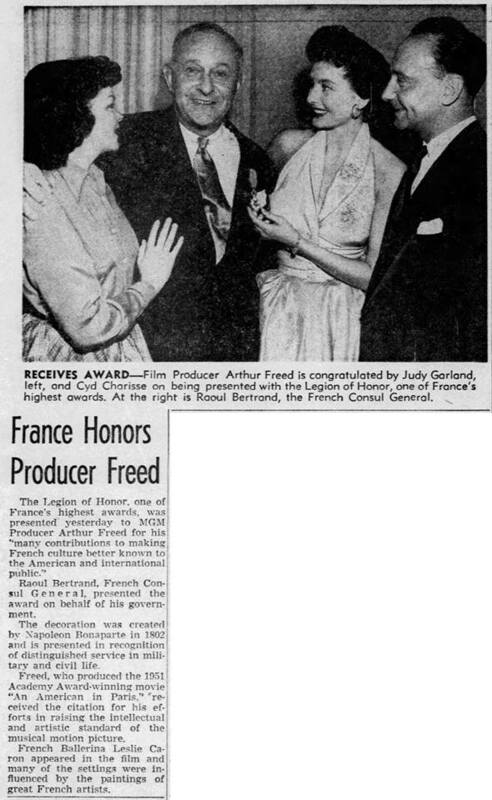 Photos: Arthur Freed, Cyd Charisse, Judy, and Raoul Bertrand (French Consul General); Newspaper clipping detailing the event). 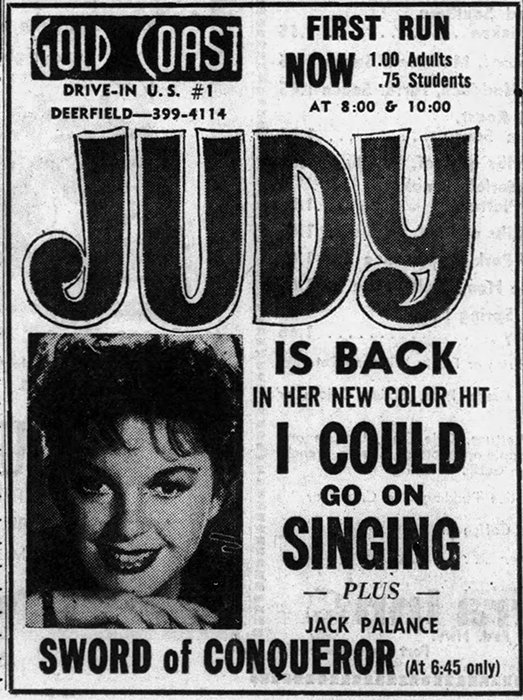 March 24, 1955: From Nashville, Tennessee’s “The Tennessean” paper is this ad making note of Judy’s father, Frank’s, roots in Murfreesboro, Tennessee. Judy was riding high at this time with an Oscar nomination for A Star Is Born and was running neck and neck with Grace Kelly as the favorite to win. Most people thought Judy had a slight edge. March 24, 1963: I Could Go On Singing was making the rounds. March 24, 1969: Judy, along with Mickey Deans and Johnnie Ray, arrived at the Hotel King Frederik in Copenhagen. They stayed in rooms 511 & 512. Judy and Mickey were filmed as they walked around the city. The filming was part of a documentary to be titled “A Day In The Life Of Judy Garland.” Footage from the film has appeared on YouTube. Here are photos of Judy, Deans, and Ray arriving as well as giving a press conference in their suite. 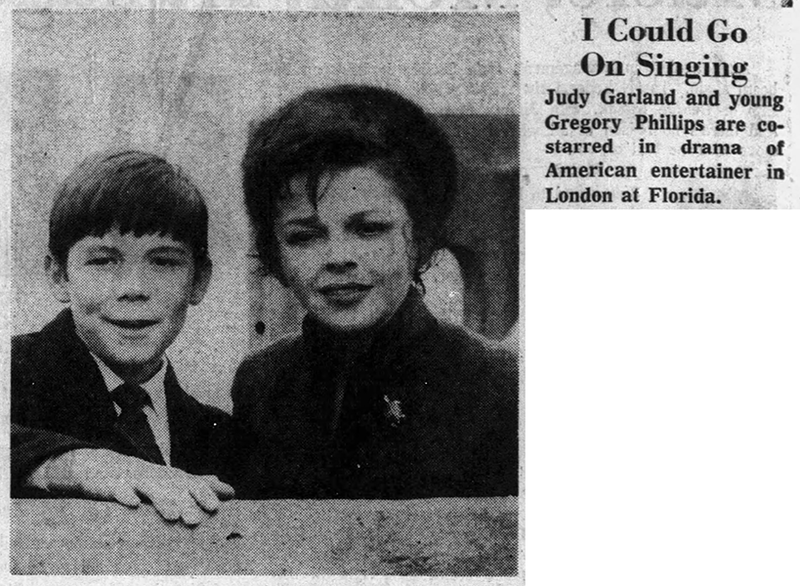 They then went to, as Judy called it, a “delightful, sweet little club,” the “Badstuestraede 10” staying until 6 a.m.
March 24, 1969: Filmed on this day, footage for A Day In The Life Of Judy Garland. This short clip is all that’s available of what was shot on this day, which was Judy and Mickey Deans walking around Copenhagen. This footage is silent. Judy, along with Mickey Deans and Johnnie Ray, had arrived earlier at the Hotel King Frederik in Copenhagen. They stayed in rooms 511 & 512. Later that night they then went to, as Judy called it, a “delightful, sweet little club,” the “Badstuestraede 10” staying until 6 a.m.
Annie Get Your Gun: I’ve always had a theory (which may not mean anything) that part of Judy’s pain here was how homely they were trying to make young Annie look. 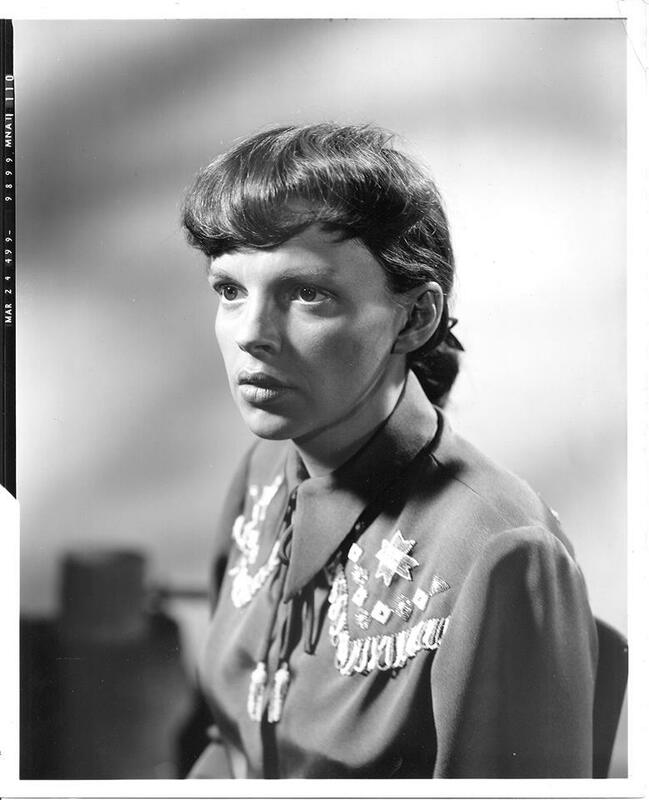 And in these costume tests, we don’t just see the illness in her eyes; we see her presented as dowdy at best. In all the films Garland made prior (even in the 30’s), MGM went to great trouble to glamorize her, or make her appear very pretty. This is the first time they deliberately downsized her appearance. I get that it was somewhat necessary for the role, but Hutton wasn’t made to look anywhere near as homely. Garland’s hair alone is horrible. I’ve always wondered if Judy’s seeing herself like this was partly responsible for her eventual breakdown. I don’t think she had the self confidence to withstand appearing so bad. In many pics, it looks like she’s continuing the character of Sairy Dodd!! That’s an intersting theory. I’m sure she didn’t feel pretty at all in that shabby, dowdy look they gave her. Even in the costume tests for Annie in the nicer outfits she’s still plain. That could just be they hadn’t made her “pretty” for the latter parts of the film. I think at her best, Judy would have been wonderful in the role.